Pick a menu that suits your corporate catering needs! PC Events has been Central Ohio's favorite corporate caterer for over 30 years! Contact us if you have any questions or would like a custom menu! Get your work day started with corporate breakfast catering. Casual lunch menus for your corporate catering event. Lunch and dinner buffet options for your corporate catering. Employee appreciation building outdoor cookout catering. Have a fun and exciting themed corporate catering event! A great supplement to your corporate catering meals! More delicious corporate catering options! Sweets can always improve employee moral! Additional options that fit your corporate culture! 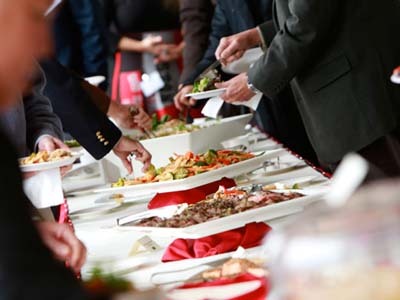 Why Use PC Events for your Corporate Catering? PC Events Catering is a very smart choice for corporate catering – years of experience. We know what’s important for your business event – make great food,make the food that you ordered, prepared fresh, professionally presented and delivered on time. When you need everything to be perfect and fresh for a few, a few dozen or a few hundred, don’t stress. Food for Thought will help you prepare your menu and deliver delicious, freshly prepared food to your home, business or on location. Drop-off catering is a smart food solution for most any social event. What is the difference between drop off catering and regular catering? When you choose drop off catering, your food is delivered cooked and ready to serve to you at the premises at the arranged time. For regular catering, our service staff assembles the food on the premises and stays for the duration of the event to serve your guests, monitor the food, and clean up after your party. Why should I go with drop off corporate catering? There are many reasons to go with drop off catering. For one, it allows you to have total control over your party – you choose when and how you’d like to serve your guests. Secondly, drop off catering will save you a significant amount of money since you are only paying for the food and not paying for a wait staff. Columbus Ohio's Favorite Corporate Catering Company! PC Events has been catering for local businesses and organizations since 1990. We pride ourselves in providing the best quality food for our customers that tastes amazing! Customers have always raved over our food and so will you and your employees! Call us today for corporate catering for your Columbus OH business. We proudly serve the entire Central Ohio area! Be sure to check out our Lunch, Dinner and Buffet options. Click on the button to download our entire corporate catering menu on PDF. We cater to your business or office! Great for holiday parties and employee appreciation week! Corporate Catering For Your Business! We provide corporate catering services to your business in Columbus, Ohio. Contact us now and learn more about how we can feed your entire team! I have used PC Events for several events. Each time has been a pleasant experience. Kevin is always accommodating. The staff is always pleasant and prepared. Thank you for making my events special every time!! Highly recommended caterer! Easy to work with! We used PC Events for our last employee appreciation meal. Kevin and his team were very professional and accommodating and the food was wonderful. We received many compliments from our employees. We use PC Events for corporate events. Kevin and his staff are great to work with. They offer a wide variety of services that make event planning easier and less stressful. For our Christmas event, we had them stay to serve and the staff were prompt, cheerful, efficient, and professional. For the breakfast we had this week, we just had them drop off the food and pick up the equipment later. The food is so good, delicious. It's clear the chef is passionate about food and that passion seeps into other areas of the business. The employees' eyes at our company light up when they learn PC Events will be catering an event for us. Can't wait for the next one! Kevin and PC Events catering came through for our event! It was our second time using them and they showed up on time, the food was excellent and the staff was super friendly. We had many people compliment us on the food and the set up. Thanks Kevin! Kevin and the PC Events staff were absolutely phenomenal. Our guests can't stop raving about the food! Not only was the food perfect, but Kevin and his staff are truly top notch. The catering manager at our reception was so nice and polite, she kept checking in on my husband and I throughout the night asking if we needed anything and if we were okay. The wait staff was just as nice and polite, while cleaning up one of the servers came up to me and said that she had hid our toasting flutes under one of the tables because she didn't want them to get misplaced. It's the little things that really give you that "Wow!" impression and I can honestly say I was completely "Wow'd!" by PC Events. If you are looking for delicious food and a professional caterer who really knows what they're doing, I highly suggest PC Events. Thank you, Kevin and staff!!! Happy employees are the best employees! When you're doing a company catering event, call PC Events! Our corporate catering is great for office functions and employee appreciation weeks! Is your company in need of catering? Look no further, PC Events has your corporate catering covered!